Evanston City Hall is located at 2100 Ridge Avenue, Evanston IL 60201; phone: 847-328-2100. Photo: Charles Gates Dawes House, ca. 1894, 225 Greenwood Street, Evanston, IL. Listed on the National Register of Historic Places in 1976. Photographed by user:Burnhamandroot, 2008, (own work) [cc-by-3.0 (creativecommons.org/licenses/by/3.0)], via Wikimedia Commons, accessed January, 2016. For several hundred years through the first quarter of the nineteenth century, a succession of Native American tribes, most recently several generations of Potawatomi, inhabited the area that became Evanston The Treaty of Prairie du Chien (1829), the Indian Removal law of 1830, and, following the Black Hawk War of 1832, the Second Treaty of Chicago (1833) hastened the removal of the Potawatomi and other tribes from northeastern Illinois and prepared the area for non-native settlement. The platting of Chicago (1830) and its incorporation as a town (1833), the opening of the Erie Canal in upstate New York (1825), the beginning of stagecoach service between Chicago and Green Bay, Wisconsin, (1836) and the surveying and sale of land by the federal government paved the way for increased immigration. The area known as Grosse Point that later became Evanston was first settled and developed by non-natives along the western branch of the Green Bay Trail (the West Ridge, now Ridge Avenue). Other settlers soon followed, building cabins along the West Ridge. A few settlers established farms on the East Ridge (now Chicago Avenue) that was twenty feet lower than the West Ridge. In 1850, nine Chicagoans — Dr. John Evans, attorneys Grant Goodrich, Andrew J. Brown, and Henry W. Clark, merchants Orrington Lunt, and Jabez K. Botsford, and Methodist ministers Richard Haney, Richard K. Blanchard, and Zadoc Hall — decided to found a university for "sanctified" (i.e., Methodist) education in the Northwest Territories. In 1851, the Illinois legislature chartered Northwestern University. After searching for a suitable site, in 1853, the trustees purchased from Dr. John Foster more than 400 acres of farmland for a lakeshore campus and surrounding town. In 1854, a plat of the town, subsequently named Evanston in honor of Dr. Evans, was filed in Springfield. Northwestern University — actually its preparatory school — opened its doors in 1855, as did its affiliated institution, Garrett Biblical Institute. In the same year the Chicago and Milwaukee (later the Chicago and North Western and now the Union Pacific) Railway began regular service, providing convenient and rapid transportation between Evanston and Chicago 12 miles to the south. The depot was located at Davis Street. Also, in 1855, the state legislature amended Northwestern's charter to exempt the university's property from taxation and to prohibit the sale of liquor within a four-mile radius (the Four-Mile Limit) of the university "except for medicinal, mechanical, or sacramental purposes." The following year the North Western Female College opened. As the population increased, new public needs had to be addressed, a reliable supply of pure water, more schools, and better roads. Evanston grew from a small, rural town with a population of less than 500 in 1854 to a large suburb of 10,775 people, according to the 1890 census. To accommodate that growth, Evanston annexed adjacent lands, including the incorporated villages of North Evanston (1874) and South Evanston (1892). Organized activity in this period focused on the populated areas, while farming remained the principal activity in the area that became northeast Evanston. Yet the governmental changes and infrastructure improvements in the original town worked to determine the course of development in northeast Evanston. The borders of original town of Evanston were complex East, Lake Michigan, North, Foster Street from Lake Michigan to Maple Avenue, then south on Maple Avenue to Church Street and west on Church Street past Ashland Avenue. South: Dempster Street from past Ashland Avenue to Lake Michigan. Evanston was an unincorporated community from 1854 to 1863, when residents voted, 39 to 8, to incorporate as a town with five elected trustees. Harvey B. Hurd was the first president. Between 1860 and 1870, the population grew from 831 people to 3,062, an increase of 269%, according to census figures. Up to the time of the Chicago Fire in 1871, the University was the dominant influence, which brought people to Evanston.. . Rigid fire ordinances followed that great catastrophe, and the enforcement of stringent regulations drove beyond the Chicago city limits those people, who desiring to build houses for themselves, had not means for the erection of structures of brick or other fireproof materials. These circumstances acted decidedly in favor of suburban localities, to which professional men, clerks, and others of moderate income were attracted... They were attracted by its [Evanston's] accessibility, its delightful surroundings, and the high character of the people who already resided in the village... 1868, developers platted North Evanston and South Evanston and built train stations at Central Street and Lincoln Street (now Main Street) respectively for their communities. The primary reason to establish these new communities was to escape the burden imposed by Northwestern's tax-exempt status Both North Evanston and South Evanston incorporated as villages in 1873 By 1874, however, North Evanston was in dire need of new sources of fresh water. The wells in North Evanston were no longer adequate, and in 1872, Evanston had annexed the lakefront land directly east of North Evanston, denying the village direct access to lake water. In 1874, North Evanston merged with Evanston. South Evanston would not merge with Evanston until 1892, although the reason for this merger was again the need for clean water. The balance of the land in the Foster farm tract purchased by the Northwestern founders extended ten more blocks north of the new town to Milburn Street and from the lakeshore west to Orrington Avenue. Intended as the ultimate site of the Northwestern University campus, this land lay outside of the town borders. This land and the land between Orrington Avenue and North Evanston were not part of either Evanston or North Evanston. Slightly higher than land to the west and south, this un-annexed land was the site of several small farms. A copy of an assessor's plat of Evanston drawn in 1867 shows Northwestern University to be the largest single landowner in that area. On July 22, 1872, sixty owners of land north of Evanston presented a petition to the Evanston Town Board requesting annexation to Evanston of the area between Foster Street on the south, the east sides of Wesley and Asbury avenues on the west, the present-day Evanston/Wilmette border on the north, and Lake Michigan on the east. With the annexation of this land in 1872, Evanston effectively cut North Evanston off from Lake Michigan. In 1874, Evanston annexed the land parcel immediately west of the 1872 annexation, as well as the village of North Evanston, which had agreed to the merger in order to gain access to fresh water provided by the new pumping station. In 1871, the Northwestern Gas-Light & Coke Company erected a small plant and furnished to a very limited number a substitute for the oil-lamps in the form of gas. It was nearly five years after this, however, before gas street-lamps came into anything like general use. And it was not until the 1890s "that an Evanston citizen could boast that his town was well lighted." In June 1872, a weekly newspaper, The Evanston Index, began publication. After a fire destroyed nearly an entire block of businesses in October 1872, Evanston formed a volunteer fire department in 1873 the same year that a free public library opened. Between 1870 and 1880, the population grew by 44%, from 3,062 people to 4,440, and the decade of the 1880s brought further improvements to Evanston By 1879, the high school offered a four-year course. In 1882, even with a $40,000 bond issue rider, Evanston citizens voted 411 to 147 to establish a township high school. Construction on the high school building began in October 1882, and the high school building opened to classes in 1883. By the 1880s, residents could take advantage of telephones, free mail delivery, and a second newspaper. Evanstonians made phone calls for the first time in December 1882. The exchange, installed in dentist Dr. Charles A.P. Gamsey's office, served 63 customers by September 1883. Free mail delivery began in 1886, which forced the assignment of street numbers, an issue that had been under discussion since 1881. 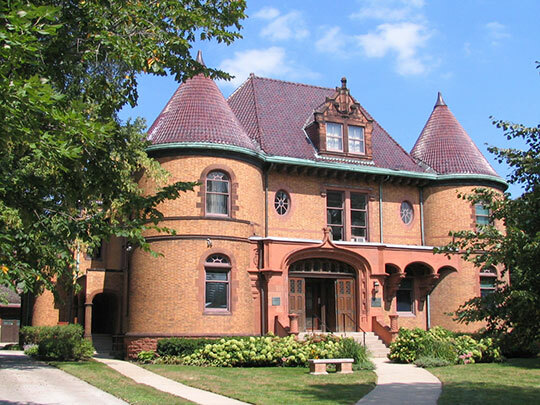 The Evanston Press, which began publication in 1889, regularly reported on the construction taking place in Evanston, describing in detail the owner, the architect, the building size and its location, and the construction materials, and sometimes even the building cost. The Evanston Index also recounted construction information but not with the regularity or the detail that appeared in The Evanston Press. Both papers have been valuable resources in documenting Evanston's building history before the City began issuing building permits in 1892. The evolution of Evanston from a small, rural community to a city required profound changes not only in the way the community was run but also in the way its residents responded to the changes. In the earliest years, activity was concentrated in populated areas of central Evanston and North and South Evanston. The people who founded Evanston and its major institutions (Northwestern University and Garrett Biblical Institute) were Methodists. For several years the only Protestant church in town was the Methodist church, and Methodist sensibilities — temperance, abolition, the personal quest to improve oneself, a concern for others — prevailed. Significant changes occurred in the decade of the 1890s. Evanston's population increased by 169%, from 7,500 to 20,144 residents, including 3,450 living in South Evanston. Land in the original village and in newly annexed South Evanston was filling with houses. In 1892, Evanston annexed South Evanston and incorporated as a city with a mayor and aldermen -two from each of six wards. The new city began issuing building permits in October 1892 and renumbered the entire street system in 1893. During the past five years [1900-05] there has been an evolution in building, and the first flat and apartment buildings have made their appearance in our midst. This is in line with the progressing movement of real estate, as they can bring a far greater income than can be obtained by other improvements. Property that is losing its attractiveness for residence purposes, and which cannot, by the nature of the case, become business property, can thus be utilized for profitable investment. By the early part of the twentieth century, it was obvious that, while unrestricted growth might be very democratic, it was not good for a mature city. The Evanston Small Parks and Playgrounds Association, established in 1909, appointed architects Daniel Burnham, Jr., Dwight Perkins, Thomas Tallmadge, and Hubert Burnham to write Evanston's first comprehensive plan. In particular, they drew up proposals for the parks, the lakefront, and the downtown, claiming to have solved the downtown parking problems "for all time." More importantly, the plan urged the enactment of a comprehensive zoning ordinance. As land became more scarce and construction costs began to rise, developers in Evanston promoted the apartment house as a cost-efficient way to provide needed housing. The proliferation of apartment houses in those early years caused single-family homeowners to become very concerned about property values. The result was a series of restricted residence ordinances that forbade the construction of apartment houses or the conversion of houses to multifamily dwellings. City Council or two-thirds of the owners on a street could create a restricted residence district. While the ordinances were not only inadequate to solve the problem and were probably unconstitutional, they did speed the process toward the enactment of a sound zoning ordinance in 1921, the first in Illinois. The first land-use designations were quite simple, based on the predominant existing use. After the passage of the zoning ordinance, apartment construction rose sharply in the areas designated for multifamily buildings. The 1921 zoning ordinance and its successors strongly influenced residential development patterns. As much as 30% of the City's land area was developed by 1921. Single-family residences were in the "A" residence districts and multifamily buildings were in the "'B" Residence Districts. By the mid-1920s, Evanston was a mature city with paved streets, an extensive sewer system, an excellent water filtration plant and pumping station, an active public transportation system, viable businesses, and a well-established school system. Evanston was acknowledged to be ahead of other lake towns in sanitation facilities, with the only water filtration plant on the lake, and one of the few lake communities with satisfactory garbage disposal facilities. Evanston also had an aging infrastructure and many buildings at least 30 years old. The 1926 Evanston Review regularly carried articles either exhorting the City to make improvements or trumpeting the City's latest accomplishments. To the Evanston Review staff, "new" was definitely good; "historic" was for museums. In 1926, at the peak of the building boom, 1370 building permits were issued totaling $15,825,670. These included 326 family dwellings and 102 apartment houses of various sizes. A few years ago the State Bank and Trust company erected a granite building which we may suppose was expected to endure for a generation or more. Wreckers this week are leveling that building to the ground. It must go to make room for a new bank building which will be several times its size. The expectation of Evanston's growth as held two decades ago is now seen to be far short of the reality. Not even the most optimistic then had an inkling of the Evanston of today and tomorrow. The officers and directors of the bank are to be complimented for their vision and for their courage in building for the new Evanston. This wrecked building of granite points a lesson to all, in public life or in business life, who are concerned with the future of Evanston. This city is outgrowing its garments of yesterday -narrow streets, insufficient parks, antiquated public buildings, tallow-candle street lighting, and most of all, its village ideas. They must be replaced by the new. In time-honored tradition, each side loudly declared opposite views and then sat down to come to a workable compromise. In 1926, the City appointed the first Plan Commission and announced the coming installation of new streetlights designed by Evanston resident and architect Thomas Tallmadge. † Gardner, Barbara and Weiss, Jack; Oakton Historic District Committee, Oakton Historic District, Cook County Illinois, nomination document, 2004, National Park Service, National Register of Historic Places, Washington, D.C.